The IPHAS collaboration, together with CASU and Astrogrid has announced the availability of the IPHAS Initial Data Release (IDR). The INT/WFC Photometric Halpha Survey of the Northern Galactic Plane is an imaging survey being carried out in Hα, Sloan r' and Sloan i' bands with the Wide Field Camera (WFC) on the 2.5m Isaac Newton Telescope (INT) to a depth of r'=20. The IPHAS IDR is a photometric catalogue of more than 200 million objects coupled with associated imaging data covering about 1700 square degrees three colours. The survey is aimed at revealing large scale structure in our local galaxy, and also the properties of key early and late populations making up the Milky Way. The object catalogues and data quality control parameters have been ingested in a Sybase RDBMS. The access to the primary data products has been implemented through use of standard Virtual Observatory publishing interfaces as provided by the Astrogrid system. The IPHAS IDR is described in a paper submitted to MNRAS (González-Solares et al., 2007). This is an image of the centre of the Rosette Nebula, as imaged in Hydrogen alpha emission in the IPHAS survey. The centre of this HII region, where the exciting star cluster (NGC 2244) is located, lies at the middle-bottom of this image (N is to the left, and E down). The longer dimension in this image is approximately 30 arcminutes. Credits: Nick Wright, University College London. Image taken using the Isaac Newton Telescope. [ JPEG ]. 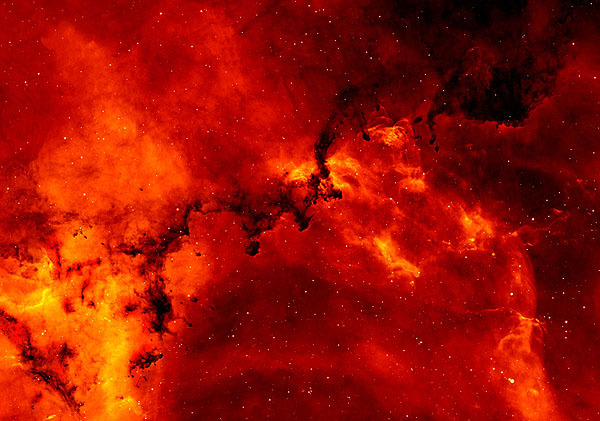 Red sky at night: Largest digital survey of the Milky Way released, STFC press release, 10th December, 2007. Available formats: TXT | HTML. IPHAS Initial Data Release (IDR) web site. The IPHAS collaboration web site. González-Solares et al., 2007, "Initial Data Release from the INT Photometric H-alpha Survey of the Northern Galactic Plane (IPHAS)", MNRAS, submitted.